3D modeling of a 25km corridor to monitor the Corsica beaches erosion. Bastia area, July 2017. Results obtained from 1840 aerial images taken by gyroplane under the leadership of Aerodronescorse, company specializing in technical inspections by drones. 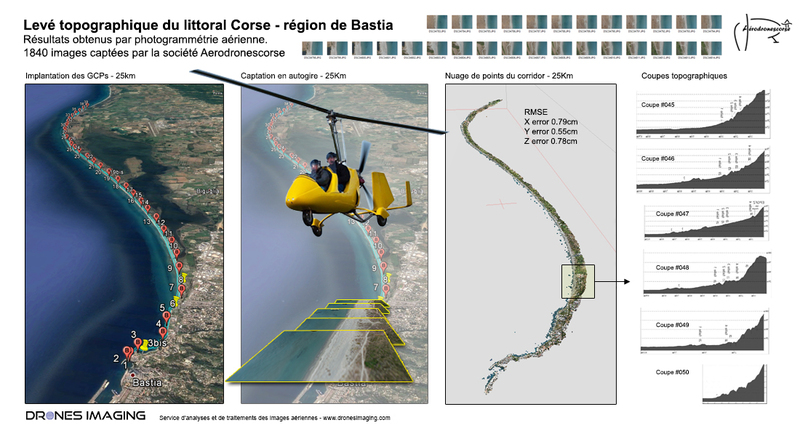 The Territorial Collectivity of Corsica (CTC, in charge of monitoring Corsica beaches) called on the companies Aerodronescorse and Drones Imaging for 3D modeling 25 km of coastline between the agglomerations of Bastia and Casamozza. With 1050 km of coast, Corsica has a very diversified coastline. But in recent years, urbanization and infrastructures have developed considerably on the coast and some residences are now threatened in the face of global warming and erosion phenomenas. In this context and in anticipation of future submersions that are harmful to populations and the local economy, the CTC commissioned a complete modeling of the coastline in order to study its smallest aspects. To carry out this first aerial topographical survey of 25 km, the gyroplane has been naturally privileged. Indeed, its flexibility of use, its endurance and payload capacity make it an airborne platform particularly adapted on this type of mission. 30mn only have sufficed to gyroplane to cover the entire 25Km of the coastline while capturing more than 1800 aerial images. Subsequently, and thanks to the photogrammetry techniques, these aerial photographs were used to produce a dense cloud (1pt every 15cm) allowing a very faithful 3D representation of the coast. The 3D model thus generated and whose spatial accuracy is a few centimeters (accuracy obtained thanks to the targets previously put on the terrain and measured by the GPS RTK) immediately allowed the CTC to automatically extract topographic profiles on the the whole corridor. If these topographic profiles already constitute an excellent support for studying the morphology of the beaches, they will also serve as an initial reference for ultimately measuring the evolution of beaches over time. Indeed, thanks to future aerial acquisitions and by temporal comparison, it will be possible to locate and quantify automatically: the sectors where there has been a gain or loss of terrain. As a result of the success of this first operation, future missions are planned in the short term but this time, over much greater distances. Thus, the CTC will soon have full digital supports to undertake preventive and targeted management of coastal erosion in Corsica. Aerial images : Aerodronescorse and Drones Imaging companies. Point cloud : 1 point / 15cm.